Draft: 2011, Los Angeles Angels, 31st rd. Is married.....wife's name is Sydney... Graduated from Thousand Oaks (CA) High School.....attended the University of Arizona... His first name is a hybrid of father, John, and grandfather, Chester, who was known as "Chett"...His father, John, a former bartender, worked on the set of the movie "Cocktail" (1988), teaching actor Tom Cruise his character's signature bottle flip... Was coached by Angels manager Mike Scioscia as a 10-year-old Little Leaguer in 1999..... was a teammate with Scioscia's son, Matt... Is a car enthusiast. Made his first career Opening Day roster... Batted .207 with 6 HR and 18 RBI in 60 games during his first season with Milwaukee... Made 44 starts, all coming behind the plate... His only start after 8/3 came on the final day of the season (10/1 at St. Louis)... The Brewers went 20-24 in his starts... The team posted a 4.87 ERA in games he caught (399ip, 216er)...Threw out 7 of 41 runners attempting to steal (17.1%)... Had three stints with the Brewers (Opening Day-6/24, 7/18-8/3 and 9/2-end)... Was optioned to Triple-A Colorado Springs on 6/25 following the acquisition of Stephen Vogt and recalled on 7/18 after Vogt was placed on the disabled list.....appeared in 12 games with the Sky Sox (.310, 2hr, 14rbi)...Was on the 10-day disabled list from 8/4-9/1 with a rib fracture (missed 25 games). Began the year at Triple-A Salt Lake, where he batted .274 with 2 HR and 21 RBI in 24 games...Was recalled by LA of Anaheim on 5/18...Batted .234 with 8 HR and 25 RBI in 70 games with the Angels...Made 60 starts, all coming behind the plate...The Angels went 27-33 in his starts...The team posted a 4.53 ERA in games he caught (520ip, 262er)...Threw out 17 of 46 runners attempting to steal (37.0%).....his 17 caught stealing ranked fourth in the American League and led Major League rookies...Traded to Milwaukee on 12/13 in exchange for C Martín Maldonado and RHP Drew Gagnon. Spent a majority of the season with Triple-A Salt Lake before being recalled on Sept. 1...Went 1-for-2 with a home run and one RBI in two games with the Angels. Made Major League debut Sept. 14 in Seattle...Entered the game as a catcher in the 8th inning...Collected first big league hit Sept. 20 vs. Minnesota with a 9th inning, pinch-hit home run...Became the 13th player in franchise history (second player in 2015; also Kaleb Cowart) whose first M.L. hit came as a home run. Hit .291 (90/309) with 21 doubles, 11 home runs and 60 RBI in Triple-A…60 RBI set a new professional career high...The 21 doubles ranked second by a Pacific Coast League catcher while his 60 RBI were ti ed for second… Had he qualified, the .291 clip would have also ranked second by a PCL backstop...Hit .333 (35/105) following the PCL All-Star break...Tabbed as a PCL Mid-Season All-Star. Spent entire season with Double-A Arkansas batting .250 (78/312) with 12 doubles, 13 home runs and 40 RBI...13 homers were a career-high...Entered the season with 16 total home runs across his first three minor league seasons...Also drew a career-best 33 walks...His 13 homers were second most in Texas League by a catcher while his 40 RBI ranked fourth...15 HBP were second most overall in the circuit...Hit .284 (42/148) with nine home runs after All-Star break compared to .220 (36/164) and four homers in first half...Added to the 40-man roster Nov. 20. 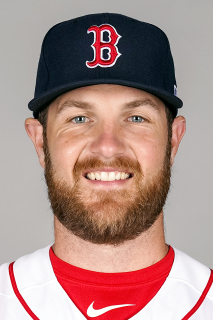 November 14, 2018 Texas Rangers signed free agent C Jett Bandy to a minor league contract and invited him to spring training. November 14, 2018 C Jett Bandy assigned to Nashville Sounds. November 2, 2018 C Jett Bandy elected free agency. June 1, 2018 Milwaukee Brewers sent Jett Bandy outright to Colorado Springs Sky Sox. May 25, 2018 Milwaukee Brewers designated C Jett Bandy for assignment. May 3, 2018 C Jett Bandy assigned to Colorado Springs Sky Sox. September 2, 2017 Milwaukee Brewers activated C Jett Bandy from the 10-day disabled list. August 31, 2017 Milwaukee Brewers sent C Jett Bandy on a rehab assignment to Wisconsin Timber Rattlers. August 4, 2017 Milwaukee Brewers placed C Jett Bandy on the 10-day disabled list. Rib fracture. July 18, 2017 Milwaukee Brewers recalled C Jett Bandy from Colorado Springs Sky Sox. June 26, 2017 Milwaukee Brewers optioned C Jett Bandy to Colorado Springs Sky Sox. December 13, 2016 Milwaukee Brewers traded RHP Drew Gagnon and C Martin Maldonado to Los Angeles Angels for C Jett Bandy. May 18, 2016 Los Angeles Angels recalled C Jett Bandy from Salt Lake Bees. March 25, 2016 Los Angeles Angels optioned C Jett Bandy to Salt Lake Bees. September 1, 2015 Los Angeles Angels recalled Jett Bandy from Salt Lake Bees. March 20, 2015 Los Angeles Angels optioned C Jett Bandy to Salt Lake Bees. November 20, 2014 Los Angeles Angels selected the contract of Jett Bandy from Arkansas Travelers. November 1, 2014 C Jett Bandy assigned to Leones del Escogido. January 14, 2014 Los Angeles Angels invited non-roster C Jett Bandy to spring training. May 24, 2013 Arkansas Travelers activated C Jett Bandy from the 7-day disabled list. March 31, 2013 C Jett Bandy assigned to Arkansas Travelers from Inland Empire 66ers. January 14, 2013 Los Angeles Angels invited non-roster C Jett Bandy to spring training. July 14, 2012 Jett Bandy roster status changed by Inland Empire 66ers. July 7, 2012 Inland Empire 66ers placed C Jett Bandy on the 7-day disabled list. Left knee contusion. April 2, 2012 C Jett Bandy assigned to Inland Empire 66ers from Orem Owlz. February 12, 2012 Los Angeles Angels invited non-roster C Jett Bandy to spring training. September 6, 2011 Jett Bandy assigned to Orem Owlz from Arkansas Travelers. September 3, 2011 Jett Bandy assigned to Arkansas Travelers from AZL Angels. July 3, 2011 Jett Bandy assigned to AZL Angels from Salt Lake Bees. June 30, 2011 Jett Bandy assigned to Salt Lake Bees from AZL Angels. June 20, 2011 Jett Bandy assigned to AZL Angels from Los Angeles Angels. June 19, 2011 Los Angeles Angels signed C Jett Bandy.